Single-elimination tournaments have one particular flaw: The tournament can only break powers of 2--i.e., 2, 4, 8, 16, 32, etc., teams can make it into the elimination rounds, unless the tournament decides to do a partial elimination round. For example, let's say the tournament decides to break 20 teams. So, the partial elimination round will involve eight teams debating, with twelve teams sitting around and waiting for two hours. The eight teams debating turns into four teams advancing to the first full elimination round, plus the twelve teams that sat around, making for a perfect bracket of sixteen. It works, but... meh. I don't like that the majority of the elimination-qualified teams did nothing for a whole round--it's kind of unfair that they could scout, plan a new strategy, or go get a nice meal and relax. And I especially don't like it, as a tournament director, that instead of just doing one big elimination round right after preliminary rounds and being done with it, I've got to drag it out into two smaller rounds. Let me explain this one a bit. Ideally, a tournament breaks exactly one-third of its preliminary teams into elimination rounds. This is the ideal because preliminary rounds use one judge, elimination rounds use three, and well, you get the math. Assuming I have just enough judges for prelims, then breaking one-third of teams will use up all my judges perfectly for the first elimination round. The tournament director can say to every judge, "You must stick around for at least the first elimination round. I need everyone. Then I will start to dismiss judges whose schools have been eliminated." It works out brilliantly if every judge is used in elim round 1, half are needed in elim round 2, a quarter are needed in elim round 3... Smooth and simple. Now consider the 20 teams breaking to elimination rounds problem. That means I have about 60 teams in prelims, and therefore 30 judges. In the partial elimination round, eight teams debate, so that is four rounds... therefore I need to use twelve of my 30 judges. In the first full elimination round, sixteen teams debate, so eight rounds, meaning I need 24 of my 30 judges. Notice how awkward and weird this has become? Some judges must judge both elim rounds--whom to pick? No one can go home until the first full elimination round is through, so that requires every judge to stay an extra two hours. Many of those judges will have nothing to do for the first two hours--I don't need them for a round. They just have to wait. Is there a better way to break a number of teams that isn't a power of 2? Double-elimination tournaments can take on any even number of teams, so the above case of 20 is no particular problem, but they run into a different problem very quickly: the double elimination rule usually produces odd numbers of teams during the tournament for some rounds. If the tournament is run with brackets, then you can see how the math works quite easily. With 20 teams to start, ten will be undefeated and ten once-defeated after round 1. After round 2, five will be undefeated, ten will be once-defeated, and five twice-defeated and eliminated. That leaves fifteen teams and the perennial problem: some team has got to get a bye in round 3. Round 3! This is less fair than a team getting a bye in the partial elimination round in the single-elimination tournament. Is there no other option? Do not eliminate teams that are undefeated. You must eliminate teams that are twice-defeated. Decide which once-defeated teams to keep based on speaker points or preliminary seed. Always keep an even number of teams. In practice, a scheduled-elimination tournament would look quite similar to a double-elimination tournament. Any (even) number of teams could break. There's an undefeated and once-defeated bracket going on in elimination rounds, just like in a double-elimination tournament. * (not necessarily--see note below!) But in many ways, the scheduled-elimination tournament is more similar to a single-elimination tournament: losing one round makes a team eligible for elimination. The tournament could decide to keep most of the once-defeated teams around, or eliminate most of them. It's up to the tournament. A once-defeated team might stick around to win the tournament, but only if the team had high enough speaker points or preliminary seed in order to never be eliminated. This being a mathematical problem, I made a graph to illustrate. The single-elimination option (green) and the double-elimination option (red) create a lower and upper boundary on possibilities for the scheduled-elimination tournament (anything in the gray area--and yes, I chose gray for its symbolism). So long as the tournament keeps the remaining number of teams in the gray zone, then it has abided by condition 1 and 2 that I specified above. The gray zone represents all the once-defeated teams in the tournament. If the tournament cuts closer to the green curve, it eliminates most of the once-defeated teams. If the tournament goes closer to the red curve, it keeps most of the once-defeated teams. As you can see, the red curve is flat at first--no one in a double-elimination tournament is eliminated after only one round. You might wonder what the two marked points, (3.32, 2) and (6.16, 2), are. This represents how many rounds each type of tournament will need to have, because two teams remaining leads immediately into the final round. The single-elimination tournament needs to have 3.32 rounds, plus the championship round. About one-third of teams participate in the partial round (eight out of 20), thus the 0.32, then the first full elim round will be sixteen teams, the second round will be eight, the third round will be four, and the fourth round will be two teams--the championship round. Four rounds, plus a partial. Similarly, the double-elimination tournament will need to have 6.16 rounds, plus the championship round. That means you're looking at seven or eight total rounds, including the championship round, depending on how the byes and pull-ups go. The scheduled-elimination tournament would have more than the four plus partial (so really five) elimination rounds of the single-elim tournament but fewer than the seven elimination rounds of the double-elim tournament. The tournament starts with 20 teams entering: (0, 20). Ten team remain after round 1: (1, 10). 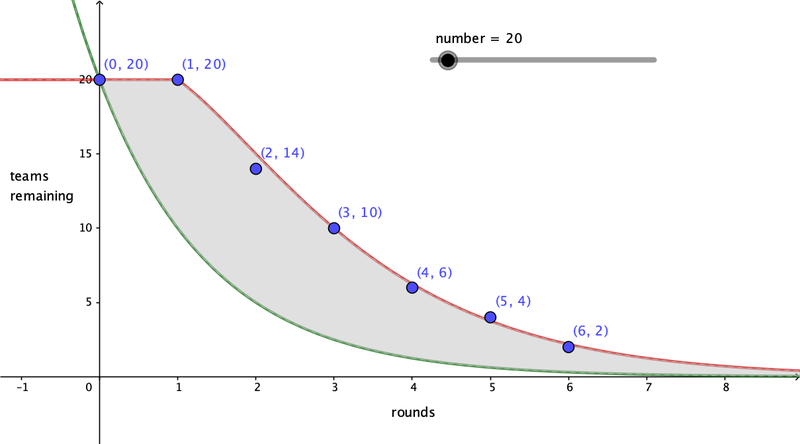 (The round itself is really the line segment from (0, 20) to (1, 10): starting with 20 and ending with 10 is round 1's effect.) After round 2, there are five undefeated teams, but the tournament keeps one once-defeated team for a total of six teams: (2, 6). There could be as many as three undefeated teams after round 3, but the tournament keeps four teams on just in case: (3, 4). After round 4, only two teams remain (4, 2), and then round 5 will be the championship round between those two teams. By keeping on perhaps two teams that are once-defeated (after rounds 2 and 3), this method eliminates having the partial elimination round where twelve teams sit around pointlessly, and it has made managing the judging pool much, much more predictable. The tournament will use: 100% of its judging pool for round 1, 50% for round 2, 30% for round 3, 20% for round 4, and 10%--the final three judges--to decide the championship round. This option lengthened the tournament by two rounds compared to the previous option, but the trade-off is that this tournament eliminated almost no once-defeated teams. In general, it's possible that a once-defeated team goes on to win a scheduled-elimination tournament (e.g., they defeat the remaining undefeated team in the final round and beat them on points) if somewhat unlikely. It's also possible that a once-defeated team survives the cut after round 3, yet even though it wins round 4, the team doesn't survive that post-round 4 cut because its speaker points aren't high enough. This outcome seems reasonable enough to me. Being eliminated based on one loss and low points seems fine to me, although I would generally want my tournaments to stay closer to the two loss and done side of the gray zone. But--it's up the tournament to decide what makes sense for their goals and available time and judges. I think I would add one other condition to a scheduled-elimination tournament, for a total of six. Condition #6 is: "Once the tournament begins eliminating teams, never increase the number of teams cut after a round above how many were cut after the previous round." In other words, the curve of cuts should flatten out. In the example graph immediately above, the cuts go: -6, -4, -4, -2, and -2. This seems reasonable and straightforward. It seems beyond silly to have the cuts go: -6, -8, -4, -2, -4, -2. Put them in a more sensible order. I've made the applet available for you to use here: https://ggbm.at/dx9kgnbb. You can change the number of teams, and move the number of teams remaining after each round up or down. The line segments between each round will only show if you meet my sixth condition of eliminating fewer (or the same) number of teams after each round than the previous round. * Fun addendum: This condition can be swapped out for a different one. The teams do not need to debate within brackets--i.e., several undefeated teams could debate once-defeated teams--so long as no cut is ever more than one-half of the teams remaining (which just seems reasonable and fair). The "no-more-than-half" rule can be substituted for the bracket condition without any risk of violating the first condition to not eliminate undefeated teams. The proof of this is fairly elementary, but let's think through an example first. Say 100% of the teams still in the tournament are undefeated (because you eliminated all the once-defeated teams). After one additional round, 50% will be once-defeated. That turns out to be the worst possible case, so the "no-more-than-half" rule keeps us on the happy side of condition #1. Let's do this more conclusively with a bit of algebra. Say x% of the teams were undefeated and y% were once-defeated (and obviously x+y=100). If x>y, then y undefeated teams might debate y once-defeated teams, leading to y% of teams remaining undefeated. The remainder of undefeated teams, x-y, will have to debate themselves. So (1/2) (x-y) will also be undefeated through that pathway. That means we have y + (1/2) (x-y) undefeated teams, which simplifies to (1/2) x + (1/2) y, or (1/2) (x+y). Since x+y=100, that means 50% will be undefeated. The worst case scenario is that as many as 50% of the teams are undefeated. Never eliminate more than half of the teams remaining after a round, and the bracket condition can be dropped. It's a huge benefit to be able to drop it! This makes many more rounds possible--so you can avoid schools debating themselves, or opponents debating each other multiple times, until the very end of the tournament. Yay!